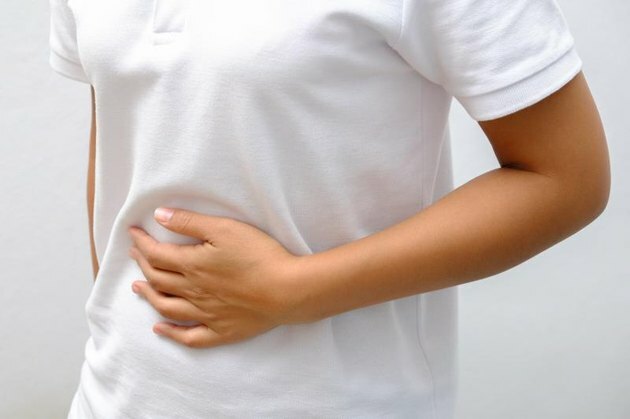 Stomach gas makes you feel bloated, crampy and downright uncomfortable. You can prevent future gas episodes by watching what you eat and drink, but if you have gas now that you want to relieve, try some soothing exercises to reduce discomfort. Light cardio activity, such as a brisk walk, can help you deflate. Simple yoga poses are also effective in relieving gas pains. HOW TO DO IT: Lie down on your back with your knees bent and feet planted, and take a deep inhale. Exhale as you draw your knees into your chest. Hug your shins with your hands or forearms. Rock side to side gently as you breath naturally. Hold for five to 10 total breaths, then stretch out long. Repeat several times, if needed. HOW TO DO IT: From a reclined position, hug your knees into your chest. Keep your knees tucked in, but open your arms to the sides of the room to make a letter "T" shape. Exhale and drop your knees to the right side and your head to the left. Keep your shoulders in contact with the mat; your knees could rest on a pillow or folded blanket if it makes the position more comfortable. Hold for several breaths, or about 30 to 60 seconds. Switch sides. HOW TO DO IT: Lie on your back and bend your knees so your heels are in contact with the mat, close to your sits bones. Inhale and lift your hips up toward the ceiling. Avoid clenching your buttocks. Rather visualize your chest expanding toward the ceiling. Hold for five to 10 breaths. Release and repeat a few more times to find relief. HOW TO DO IT: Kneel on all fours on a mat to cushion your knees. Sit your hips back to rest toward or on your heels. Reach your arms out in front of you on the mat. Put your forehead into the mat, or if the mat is too far away, onto a yoga block or blanket. Hold for 30 to 60 seconds. HOW TO DO IT: Kneel on a mat with your hands under your shoulders and knees under your hips. Inhale and let your belly sag toward the floor. Simultaneously lift your chest and tailbone. Exhale and arch your back broadly. Feel like you're mimicking the position of the iconic Halloween cat. Alternate between the two poses five to 10 times. HOW TO DO IT: Get into a lunge position with your right knee in the mat and your left leg forward. Stack your left knee over your left hip. Raise your torso perpendicular to the floor and bring your hands to heart center. Exhale and rotate to the left, placing your right hand or right tricep outside your left thigh. Hold for five breaths. Switch sides and twist to the right for five breaths. You may not believe you can breathe your gas away, but sustained, concentrated yoga breaths really can help. When you simply focus on inhaling and exhaling, you calm your central nervous system. Sometimes, gas and bloating can be a side effect of stress. When you soothe stress with breath, simply breathing exercises help soothe gas. Training yourself to breath deeply and completely may also protect you from future bouts of gas. Eating too quickly can cause you to swallow air when you chew, resulting in bouts of bloating. Mindfulness of the breath helps slow you down and become aware when you're snarfing your meals and not breathing optimally. HOW TO DO IT: Sit in a comfortable position on a mat or in a chair. Place one hand on your abdomen. Close your eyes and take a deep breath in through your nose. Feel your abdominal wall rise with the breath. Exhale through the nose, and feel the belly deflate. Spend one to two minutes, or longer, breathing this way to soothe your system and bring awareness to your breathing patterns.